Home » Technical Libirary » Industry knowledge » What are the types of steel sheet piles? What are the types of steel sheet piles? Steel sheet pile according to its processing and production process can be divided into: hot-rolled / Larsen steel sheet pile, cold-formed thin-walled steel sheet pile. Now due to the production conditions and the size of the restrictions, hot-rolled steel sheet pile in the country there is no production line, China's hot-rolled steel sheet pile are used abroad. Common hot-rolled steel sheet pile manufacturers are Korean modern steel mills, Japan Nippon Steel Works, Japan's Sumitomo steel mills, Japan JFE steel mills, as well as some manufacturers in Europe and America. Cold bending pile production technology and process requirements are relatively easy to achieve, so the domestic manufacturers or more. In the construction of the cold-formed steel sheet pile application range is narrow, mostly as the application of materials to add, hot-rolled steel sheet pile has been the main application of engineering products. 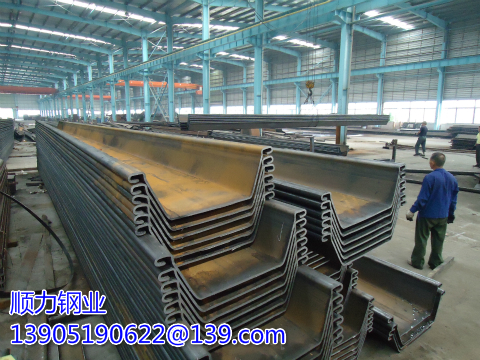 Based on the advantages of steel sheet pile in construction work, the State Administration of Quality Supervision, Inspection and Quarantine and the National Standardization Management Committee issued the "National Standard for Hot Rolled U-Shape Steel Pile" on May 14, 2007, and on December 1, 2007 Formal implementation. At the end of the 20th century, Maanshan Iron & Steel Co., Ltd. has produced more than 5,000 tons of U-shaped steel sheet piles with a width of 400mm, and successfully applied it to the cofferdam of Nenjiang Bridge, Tons of dock and Bangladesh flood control projects and other projects. However, due to the low production efficiency during the trial production, poor economic efficiency, lack of domestic demand and lack of technical experience and other reasons, failed to continue production. According to statistics, China's annual sales of steel sheet pile remained at 30,000 tons, accounting for only 1% of the world, and only limited to some ports, terminals, shipyard construction and other permanent projects and bridge cofferdam, foundation pit support Such as temporary engineering.